A friend was having a shower to celebrate expecting her 3rd boy, yay for 3 boys! They are so much fun! She wanted a blue/teal ombre cake with a whale to match her invitation. I've done a few ombre cakes before and have found a few things helpful in planning. So, in addition to the finished pictures, I'll add some "along the way" pictures with tips on how to do it yourself! Tip #1. Ombre cakes need to be TALL. At least three layers. This cake is four layers (it had a cake plate in there as well, since it was actually two 8" cakes stacked on top of each other). Tip #2. Get the frosting the colors you want before you start. And MAKE SURE you have enough of each color because it will be almost impossible to match your color exactly if you run out. Also, just know that the color will continue to deepen for at least an hour or so after you color the frosting. So if you are tempted to add "just a little bit more," wait a while to see if it turns into the color you want as the food coloring saturates the frosting. Tip #3. When using this dot method it is not possible to completely cover the cake underneath with the dots. That means you'll want to do a crumb coat. Most people just use plain white frosting to crumb coat and then pipe with the different colors. Since I didn't want to have to worry about stark white peeking through the dark teal blue, I used the individual colors to crumb coat up the cake. The advantage to that is you can visually decide where you want the colors to graduate and have a guide to how many & how large you want to pipe your dots. First, I broke my Tip #2 and wasn't sure I had enough frosting for each color gradation. (See how the cake looks pregnant in the middle, it's because I didn't have enough frosting to level the sides completely, but I knew it wouldn't be as noticeable once the rest of the frosting was on.) So I decided to do the white first and that way if I had extra white I could add it to the darker color and add more food coloring if necessary. Second, I didn't have enough tips the same size. In fact, I'd already fudged with a smaller tip by squeezing out more frosting, and that got old. So once I was finished with the white bag tip, I switched it to a colored frosting bag. If you only have one tip, this is how you'd want to work it. **The best way to do one color at a time is to mark off where you want the rows to be so you can make your dots the appropriate uniform size. See the picture above where I made horizontal line marks in the frosting. (But yes, you observant people, I redid my marks when I decided to do 9 rows instead of 8.) However, you'd want to make more than just one set of marks, I would make at least four sets of horizontal marks around the cake. Tip #4. Ok, this is important. When you do the top, START IN THE CENTER. This is where I have probably confused some people. I know I said I started with the white because I wasn't sure I'd have enough frosting. Well that is mostly true. I did that first row on the side. But then I stopped and did the top middle before I continued. But you'll also notice I did four colors on the side but only three on the top. My extra frosting went to the lightest teal so that my medium teal and dark teal were the same on the top as they were on the sides. Long story short, make sure you have enough frosting and you won't have to jump around in the order of your piping. So back to Tip #4. Find the center and pipe a single dot. Do a small smear. Then pipe a dot the same color on top of that smear. Now smear it in an arc/circular motion. The nice thing about doing it this way is once you're back at the beginning you can smear outward and to the side of the first dot so it looks seamless in the center. It's harder to do that on the outer rings of the top though. In that case, you'll just finish it off with a single un-smeared dot, like you do the sides. 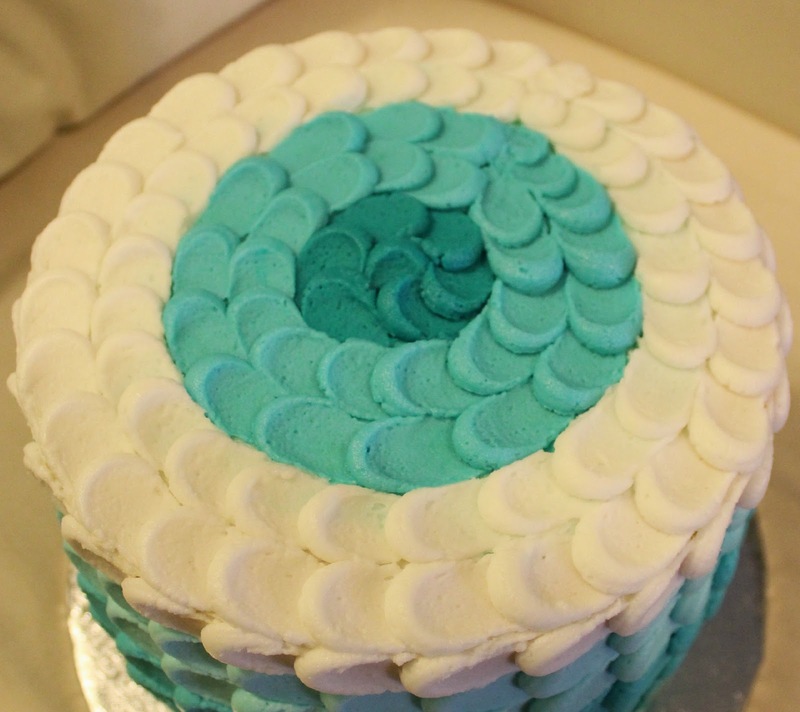 And there you have it, my two cents on the ombre cake.